WhatsApp is the most popular messaging platform today. It introduces many features to provide best messaging experience to its users. Every app has some bugs. Even WhatsApp has bugs. Today we will show you a bug which lets you crash WhatsApp with a single black dot. A WhatsApp message is being spread online these days. It boldly declares not to touch a black dot in a message. It warns if you touch, your whatsapp will hang. When you see this message you will definitely touch it to see if it works. And the truth is that it is real. 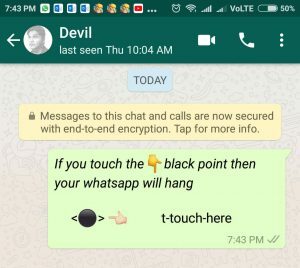 If you touch the black dot, whatsapp will crash and gets hanged. Most of the users are afraid that it contains a virus which is crashing your whatsapp. But it is not true. When you convert the message into HTML, you will find that the code is not malicious. It contains something called as control character ‘&rlm’. This unsupported invisible character is repeated multiple times. The reason whatsapp gets crashed is that it is unable to process such long characters. There is no need to worry because it is not any malicious code or virus. It is just a combination of long unsupported text. WhatsApp will very soon fix this bug. But till then you can fool your friends and play prank on them. You can copy the code from below link and send it to your friends. Many users have reported that this bug is available on other messaging platforms like messenger, telegram etc. So, don’t be afraid when you receive such message. It is harmless. If you still want to avoid, just don’t click on the black spot. You can also read our post on How to Send Blank Message on WhatsApp. If you found this post helpful, please like it and share it on your social networks with your friends to make them aware of this bug.